Jean-François de Troy (1679-1752) was born in Paris and was first taught by his father. He later attended lessons at the Académie Royale de Peinture et de Sculpture and sojourned in Italy from 1699 to 1706. He specialised in history painting and genre painting with erotically charged scenes, for which he became best known. He was one of the leading painters of the Parisian high society and was nominated, in January 1738, Director of the Académie Française in Rome where he died in 1752. This painting is a good example of the gallant pieces fashionable in the 18th-century France. 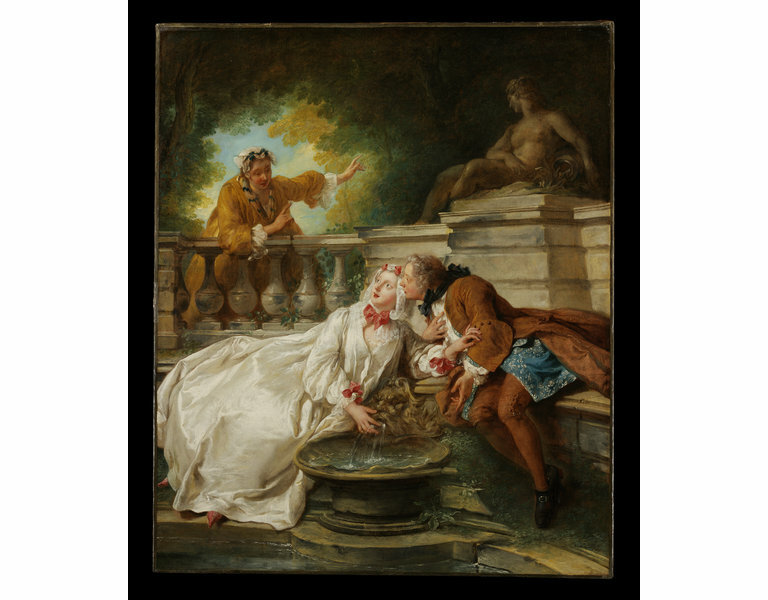 It depicts a secret rendezvous set in a romantic garden by a fountain while a maid interrupts the conservation with a dramatic gesture. This painting is one of the earliest ‘tableaux de mode’ by de Troy, a genre he is credited to be the inventor. A couple of lover sits by a fountain with a grotesque; above a reclining classical nymph surmounts a balustrade, upon which a maid leans towards the couple with a dramatic gesture. Historical significance: Originally attributed to Watteau, this painting has been restored to de Troy's authorship before 1893. It is a good example of the erotically charged genre scenes for which de Troy became best known. 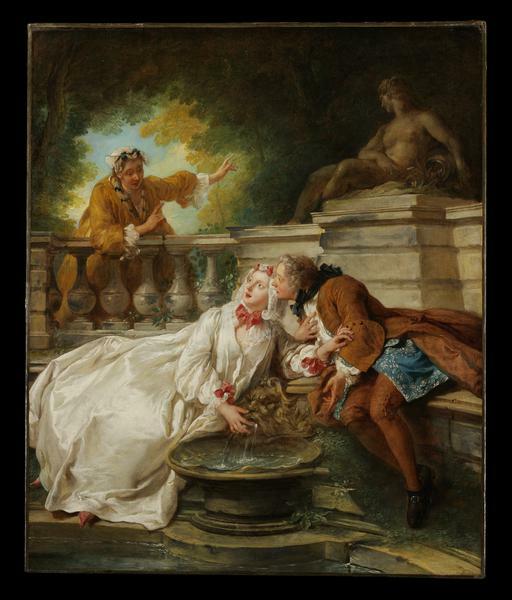 It shows two lovers at a fountain, interrupted by a maid. They wear typical 18th-century costume and are depicted in a romantic garden. The gesture of the lady in white with one hand on the fountain grotesque's mask echoes the gesture of the sculpted nymph above and alludes to her secret rendezvous. 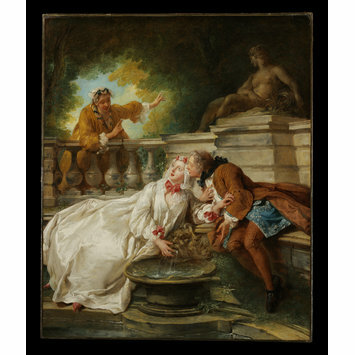 This compositional idea is reminiscent of the art of Watteau who developed the genre of the 'fête galante' at the beginning of the 18th century. Although Watteau's 'fête galante' was pervaded with mystery and a sense of timeless feast, de Troy presents a more authentic portrayal of contemporary manners, fashions and pastimes, hence the appellation 'tableaux de modes', whose invention he has been credited with. The presence of nature plays an important role in these pictures and contributes in developing a formula repeated with success by many artists until the French Revolution. These gallant pieces intersect with the taste for a new sensuality, developed later in the century in the libertine philosophy and exemplified in such texts as Dangerous Acquaintances by Choderlos de Laclos and the Marquis de Sade's Philosophy in the Bedroom. 'Fuyez Iris, fuyez: ce séjour est à craindre. lls allument un feu difficile à s'eteindre'. Pastoral is a genre of painting whose subject is the idealized life of shepherds and shepherdesses set in an ideally beautiful and idyllic landscape. These scenes are reminiscent of the Arcadia, the Antique Golden Age that the Roman author Virgil (1St BC) described in the Eclogues and were at the time illustrated on the Roman wall paintings. The pastoral was reborn during the Renaissance, especially in Venice, in the oeuvre of such painters as Titian (ca. 1488-1576) and Giorgione (1477-1510), and gradually evolved over the centuries. In the 17th century, Arcadian themes were illustrated in the Roman school led by the painter Claude Lorrain (1604-1682) whereas a century later, Antoine Watteau (1684-1721) and his followers forged the new genre of fêtes galantes, which appears as a derivation of the pastoral. The pastoral became the hallmark of the Rococo movement in which François Boucher's (1703-1770) elegant eroticism found his true expression. This tradition, which had become an illustration of the carefree aristocratic world, died with the French revolution and was never revived although the celebration of the timeless Mediterranean world in the oeuvre of such painter as Henri Matisse (1869-1954) may be seen as a continuing interest for the theme. C.M. Kauffmann, Catalogue of Foreign Paintings, I. Before 1800. London, 1973, pp. 275-276, cat. no. 342. Handbook to the Jones Collection, 1884, p. 139 f.
C. Phillips in The Burlington Magazine, xiii, 1908, p. 345. B. Long, Catalogue of the Jones Collection, London, 1923, p. 41, pl. 26; repr. Connoisseur, lxxix, 1927, p. 250. L. Dimier, Les peintres français du xviiie siècle, 1930, p. 6, pl. 2 (reversed). U. Thieme and F. Becker, Allgemeines Lexikon der Bildenden Künstler, xxxiii, 1939, p. 441. C. B. Bailey et alii, The Age of Watteau, Chardin and Fragonard: Masterpieces of French Genre Painting, New Haven and London, 2003, cat. no. 27, p. 166-167. D. Wakefield, French Eighteenth Century Paintings, London, 1984, p. 52, fig. 49. De Watteau à Fragonard. Les fêtes galantes Paris: Musée Jacquemart-Andre, Institut de France, 2014. ISBN: 9789462300460. De Troy’s light-hearted paintings of contemporary scenes suited the tastes of a new clientele, the increasingly prosperous bankers and financiers of early 18th-century Paris. He captured fashionable dress and manners, and reflected the relaxed behaviour in the years that followed the death of Louis XIV in 1715. The clothing reveals the high social status of the protagonists of this amorous interlude. This is one of several paintings by De Troy based on the theme of lovers interrupted. Compared to the disarray hinted at in other scenes, the couple here maintain their composure admirably well. As with all of De Troy's work, the narrative is key - one wonders who is approaching and why the liaison must be kept a secret. by JEAN FRANCOIS DE TROY (1679-1752). French school. In an 18th century carved frame. painted portraits and historical and mythological subjects as well as genre scenes. The pair of lovers seen here re-appear in several other paintings by him of this period. These are among his most attractive works.